EUR/USD: Wave analysis and forecast of 06.06 – 13.06: The pair is undergoing correction. Downtrend will continue. Estimated pivot point is at the level of 1.35. Our opinion: In the short-term: buy the pair from the correction above the level of 1.35 with the target of 1.3740. In the medium-term: wait for the completion of correction of the in-lead downward impetus and sell the pair with the target of 1.34 – 1.33. Alternative scenario: Breakout of the level of 1.35 will allow the price to continue the decline to the levels of 1.34 – 1.33. Analysis: Presumably, the formation of the first wave, which took the shape of the wedge, has completed. Locally, upward correction is being formed as the second wave, which is taking a shape of the irregular plain, with the developing final wave с of (ii). If this assumption is correct, following the completion of the local correction, the pair may continue to decline in the third wave. 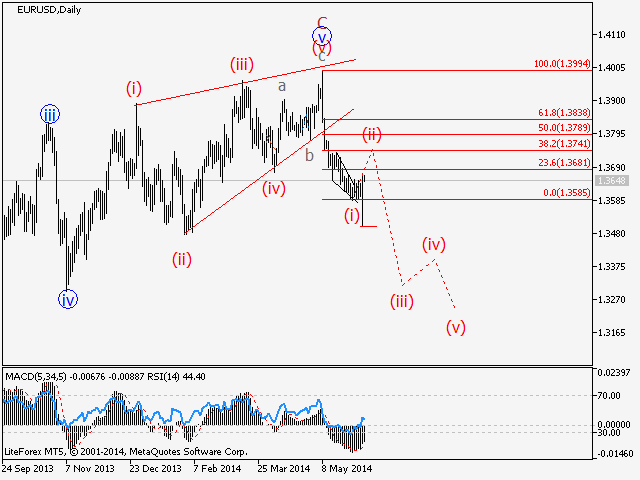 GBP/USD Wave analysis and forecast for 06.06 – 13.06: The pair is likely to decline. Estimated pivot point is at the level of 1.6916. Our opinion: Sell the pair below the level of 1.6916 with the target of 1.66. Alternative scenario: Breakout and consolidation above the level of 1.6916 will enable the price to continue the rise up to the level of 1.70. Analysis: Due to long-lasting ascending correction and the fact that the pair has reached the level of 1.6810, the scenario of the formation of the third wave to the level of 1.6650 has been changed. At the moment, it is not excluded that the pair may continue to decline in the fifth wave and the diagonal as the in-lead wave of the supposed downtrend will be formed in the medium-term. Critical level for this scenario is the level of completion of the second wave (ii) – 1.6919. In case of breakout of this level, a complete zigzag will be formed and the pair may continue to rise up to the level of 1.70. 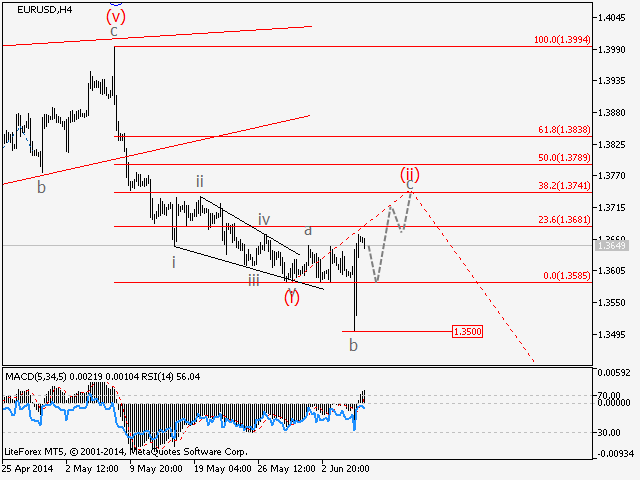 USD/CHF Wave analysis and forecast for 06.06 – 13.06: The pair is undergoing the correction. The rise in the pair is likely to continue. Estimated pivot point is at the level of 0.87. Our opinion: Wait for the completion of correction and buy the pair above the level of 0.87 with the target of 0.9150 – 0.9200. Alternative scenario: Breakout of the level of 0.8700 will allow the pair to continue the decline to the level of 0.86. Analysis: Presumably, the formation of the first, in-lead wave has completed. Locally, it is likely that the descending correction is being formed, as the second wave, which is taking a shape of the irregular plain. If this assumption is correct, following the completion of correction, the pair may grow up to the level of 0.91 – 092. Critical level for this scenario is 0.8700. USD/JPY Wave analysis and forecast for 06.06 – 13.06: The decline in the pair is likely to continue. Estimated pivot point is at the level of 102.99. Our opinion: Sell the pair below the level of 102.99 with the target of 100.0. Alternative scenario: Breakout of the level of 102.99 will allow the price to continue growth to the level of 104.0. Analysis: Presumably, the formation of the final wave of the zigzag АВС is still ongoing on the daily timeframe. Locally, it seems that the formation of the fourth wave of the proposed diagonal in the wave C has completed. If this assumption is correct, and the price does not break down the critical level of 102.99, the pair will continue to decline to the level of 100.0. 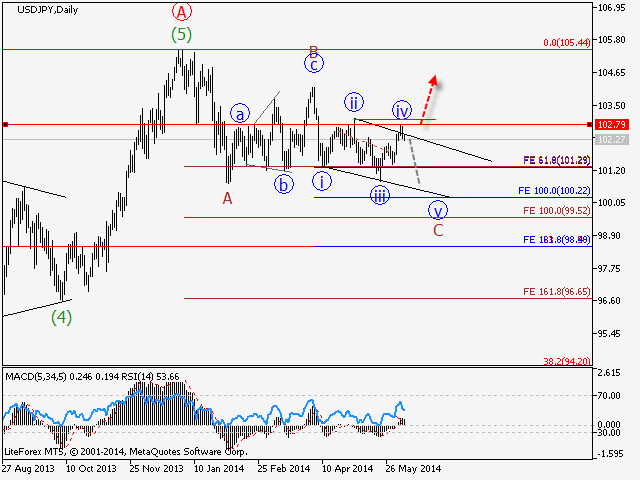 USD/CAD Wave analysis and forecast for 06.06 – 13.06: The pair is likely to grow. Estimated pivot point is at the level of 1.0819. Our opinion: Wait for the completion of the correction and buy the pair above the level of 1.0819 with the target of 1.1000. Alternative scenario: Breakout of the level of 1.0819 will allow the pair to continue the decline to the level of 1.0720. Analysis: Presumably, the formation of the downward correction in the fourth wave с of 4 has completed. Locally, the in-lead wave as the impetus has been formed and the “bearish” correction to the levels of 1.0890 – 1.0870 is being developed. If this assumption is correct, and the price does not break down the critical level of 1.0819, following the completion of the second wave it makes sense to expect the rise in price to the levels of 1.1000 – 1.1100.